Ryan Feeney works in the Indy Art Forge studio. 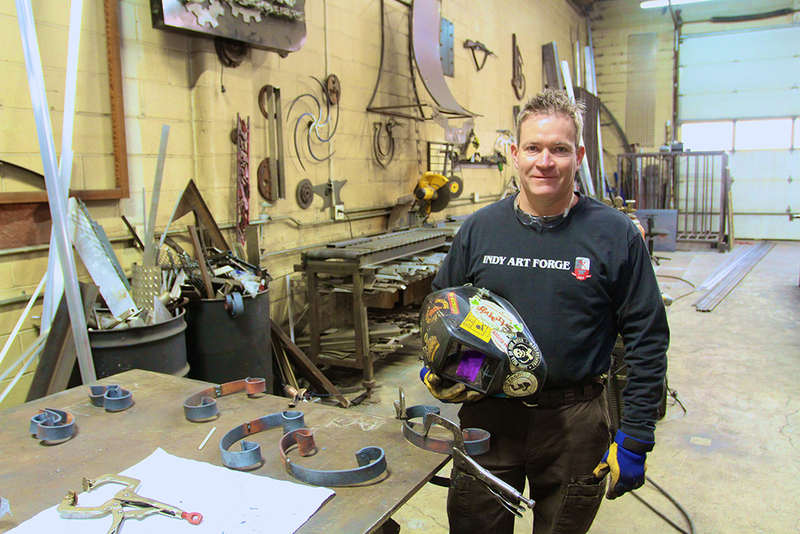 Indianapolis firefighter Ryan Feeney became interested in art at a young age, and that interest allowed him to pursue a successful career in art. The 44-year-old Indianapolis resident recently completed the Peyton Manning sculpture in the Lucas Oil Stadium atrium. He has created an array of other breathtaking pieces through his years of metal work. But his favorite work isn’t the Manning statue, but rather an 8,000-pound peace dove clutching an olive branch in its beak. The piece was sculpted from more than 1,500 guns confiscated off the streets by the Indianapolis Metropolitan Police Dept. The guns used for the project spanned decades. Feeney said one was from the Civil War era. The dove is at the Indianapolis Public Library downtown, hanging in the main atrium. Feeney also forged the eagle on top of the 9/11 Memorial in downtown Indianapolis. Yet, much of his artwork isn’t conspicuous in the form of statues, but rather staircase railings and residential work. He launched his company, Indy Art Forge, in 1999 after he graduated from Miami (Ohio) University. Feeney attended Cathedral High School in Indianapolis, where teachers helped shape his love of all things art. He also launched the rugby program there after attempting to play at Lawrence North High School until the travel time began to interfere with his practice. Feeney completed many paintings and drawings but didn’t work much in 3-D until he got to Cathedral. That introduction led to his double major in graphic design and sculpture. As a firefighter, Feeney has a schedule conducive for an artist. He works 24 hours with the fire department and then has 48 hours off. 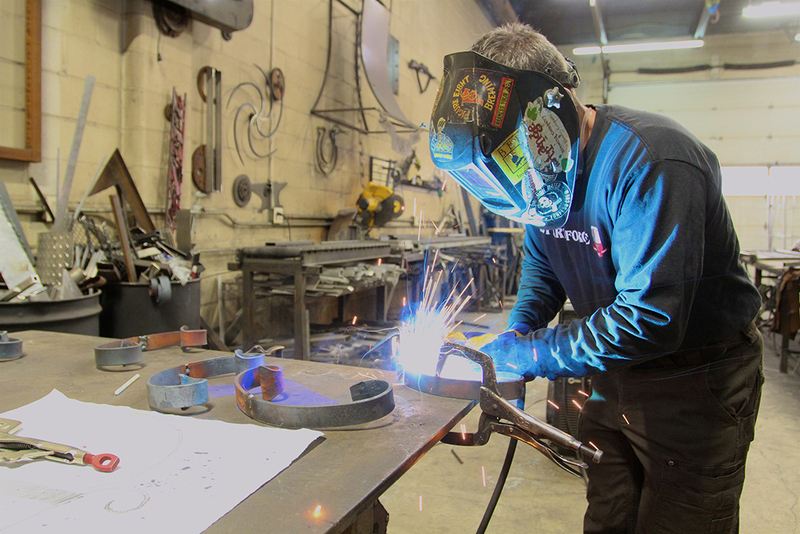 During his off-time, artist Jimmy Story handles clients and helps Feeney with his art projects. Story joined Feeney in 2015, after Feeney’s original business partner left. Before joining Feeney, Story worked for a commercial door shop. Besides helping Feeney with the business side of things, the partnership has inspired Story’s creative side. Story said the most important thing he’s learned from working with Feeney is artistic confidence and having a transparent relationship with clients. Sculptor Ryan Feeney brought a local touch to creating the Peyton Manning statue in Lucas Oil Stadium. 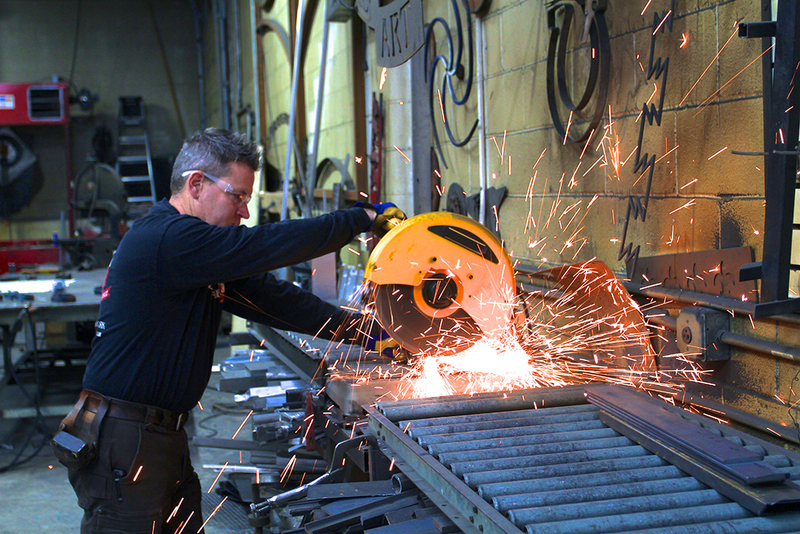 The Indianapolis firefighter acknowledged the hardest part of the project was Manning’s helmet. Manning, however, wanted the helmet smooth, so Feeney crafted it that way. At the unveiling last fall, Feeney not only got Manning’s approval, but Manning’s mother’s as well. “It was one of the scariest and happiest times in my life because I was like, ‘I’m pretty sure this is going to end up on ESPN,” Feeney said.